Inspiration struck this morning as I was making coffee, still in whatever you would imagine I wear to bed, contemplating whether to cook some eggs. As I let my mind wander it bounces over past and future events with little heed for the present. The present exists currently only to serve coffee, that’s been thoroughly determined in the morning hours. I’ve adopted a two week schedule for the current D&D game which gives me plenty of time to prepare, and more reasons to hang out with my players outside of the game. Concurrently, the Pathfinder game that I’m playing in has adopted a similar two week schedule, so a few days after my game runs, I’m a player in the next one, giving me a nice balance of DM/Player activity. It should be noted here that my DM is also one of my players, the roles transpose, and I get to see where he’s picked up some interesting bits from playing in my game. Many of the aspects in modern d20 era games are very specific, getting down to the nitpicking of feats, specific thresholds of skills unlocking higher tiers of play, and +1 bonuses galore to an excessive amount of gameplay elements. I stand by the fact that 3e was designed conceptually as a basis for computer based RPG’s from the transition period of Baldur’s Gate moving into Neverwinter Nights. Basically, modern RPG’s feel more like metagaming for optimal results, and less about immersion in what your character has truly accomplished. If you build it wrong, you’re going to be underpowered for whatever CR rating your group is supposed to be able to handle. 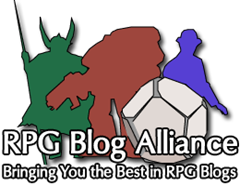 The Pathfinder group is chock full of players who understand the metagaming aspect in depth, where I am one to scorn it and build something that is interesting to play. A cold-based Sorcerer with the Throw Anything feat and a bag of trinkets, slowly working into the Arcane Archer prestige class. It’s been a messy game for me thus far to say the least. It’s been fun, although not terribly effective. I like to believe that the DM involved has let many of my actions in game fall under feasibility instead of strict rulings, and as players picked up on this type of ruling environment, they’ve made adjustments as well. Between both of these groups, only two players cross-over to both games. The rest of the players in my game seem more adjusted to my style, and tend to play with the assumption that what exists on paper only serves to justify their actions in game, rather than direct them. I find the two player from the Pathfinder group are more wary, lacking a solid base of this “I CAN do X Y Z” mentality. The rest seem willing to get into the thick of things, fight tooth and nail, and create opportunities to shine. The essence of creative play is alive and well, often times rewarded, but not without risk, as players encounter situations where they aren’t really sure if something is going to work out. It serves as a crucial aspect of tension, which builds excitement, doubt, and uncertainty, that I feel is really needed for a game to grasp that elusive sensation of depth and meaning. I enjoy both roles, in enabling this sort of feasibility in my game by pushing players to use creative means to overcome challenges, and in doing so in a game that supports a stronger metagaming role. When it comes down to roleplaying a character it’s relatively simple to look at your defined skills and use them when appropriate. Whereas taking a step outside of defined parameters adds an uncertain element of play that can do so much more for defining a session or even a character, than any set of rules could imagine. This is my essence of roleplaying, where it truly shines. You’re not stuck in a box, burdened with the rules, they exist merely as a basis in a world where so much more is possible if you give it some thought and have a DM willing to let you roll with the unexpected and undefined.